Last December 18, presidential candidate Grace Poe attend a forum with migrant workers at the University of the Philippines- Diliman. She was asked by one of the attendees on what is her opinion on the cases that she is facing right now about her residency.Poe then replied that the one who can understand her the most are the Overseas Filipino Workers (OFW) because they know what life is in other country. 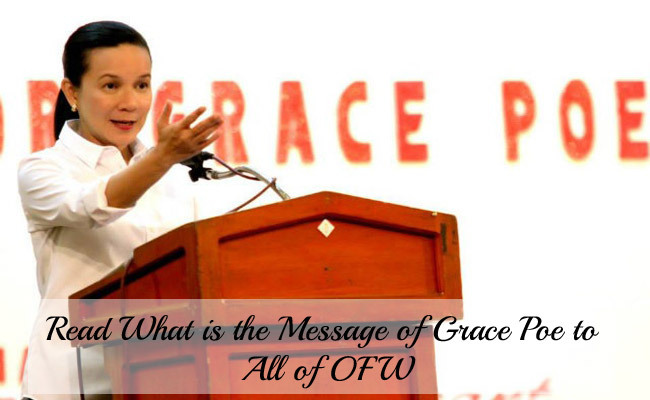 It was recently decided by the Commission On Elections to disqualify Grace Poe's candidacy on the 2016 elections with a reason that the senator is not a Filipino and she failed to comply a ten year residency to become a presidential candidate. She admits that her life abroad was never easy. Most people thinks that she had a very comfortable life there but it wasn't then she returned on the country in 2005. It was the most difficult time for her when it was an Arroyo Administration and the death of her father when they are seeking for truth and justice.She also relates her situation with the OFW's by saying that if they are sending gifts or money to their relatives they are called heroes but if they will enter politics they are not heroes anymore. She insists that she didn't leave the country before to have a better life abroad and no one should measure ones intention to serve the country on how long he or she stayed. Despite the issues that she is experiencing now, she still thinks positively and her conscience is pure. Poe then links Mar Roxas and Vice-President Jejomar Binay camps on her disqualification cases. As the 2016 elections is nearing, each of the candidates have different issues. It may be personal or their previous works. Their counterparts are having hidden agendas to find the weakness of the strong opponent.In Grace Poe's case, they use her questionable residency. As a citizen, we are free to choose the leader who deserves to serve our country.Just let the senator run for president if her opponents are not afraid on her capabilities.